In the past five years the economy of Gloucester has remained relatively unchanged with population, business numbers and workers all holding at good levels. With over 700 diverse businesses, employing 1,800 people that deliver over $500 million in economic output. in Gloucester being run by sole operators or owner/operators. Agriculture is the largest industry sector of employment in Gloucester, supported by a great climate and water availability. 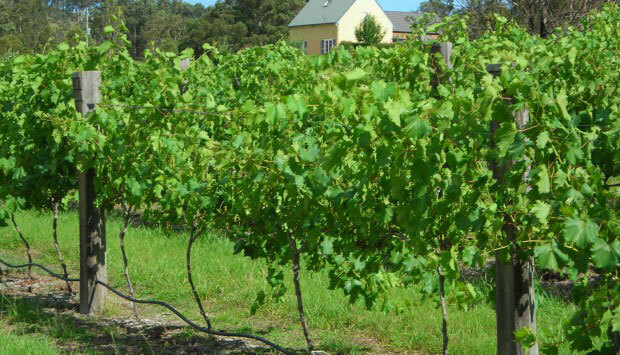 The region is dominated by beef cattle, dairy and non-cereal broad acre crops, there has been recent innovation into emerging agribusiness areas. There is approximately 500 farms in the Shire with about 57,000 beef and dairy cattle. Beef grazing is the largest enterprise and occupies approximately 128,500 ha with dairy farming utilizing another 13,200ha. Yancoal operates Duralie & Stratford in the Gloucester basin. Stratford is 10km south of Gloucester and the coal is railed to the Port of Newcastle. Duralie at the southern part of the Gloucester basin is 20km's south of Stratford. Both are open cut coal mines.Coal is washed at Stratford and railed to the Port of Newcastle also for export and domestic use. At present both mines have had to adapt to weaker market conditions, revised mining contracts and reduced rosters. Rocky Hill Coal Project is a small, modern, open cut modern mining proposal, that, if approved, will bring jobs and other economic benefits to the area. There is an active light industry and manufacturing sector, with the number of manufacturing businesses showing steady growth in the last decade. Manufacturing employs 118 workers and delivers over $66 million in economic output and skill sets in the sector are strong. From shipwrights, to earthworks, to crane drivers to specialised work, Gloucester has manufacturers that can turn their hands to anything and value-add to businesses. We have numerous businesses that compete globally and around Australia. The growing Industrial Park (below) is located just a short five minute drive from the town centre. 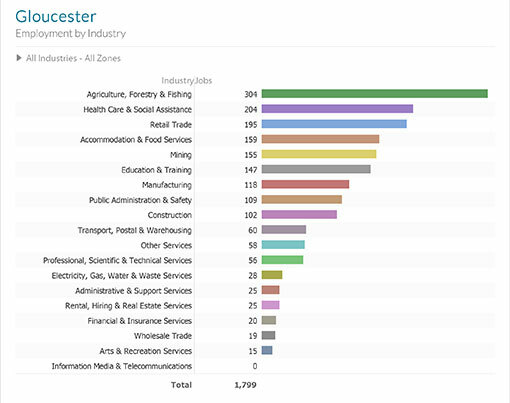 Within the Destination NSW LGA Profile for Gloucester, 240 jobs and $51 million is the total visitor expenditure i.e. how much a tourist spends within a region. Below is the estimated percentages that relate to industry sectors' output that is generated to service demand from tourists. These percentages have been applied to the economic profile of the local economy to estimate the contributions of tourism. 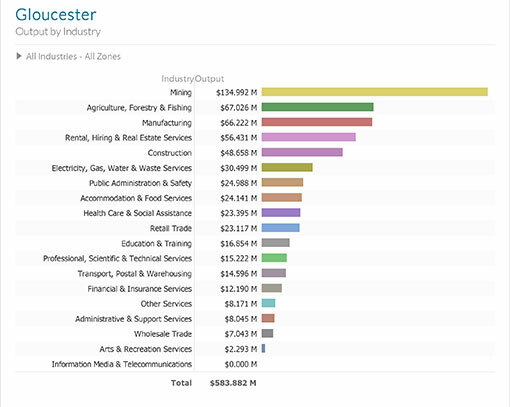 The percentages are based on the specific structure of the Gloucester economy. The greater the number of visitors to the area, the greater the employment in tourism related industry sectors, and therefore the higher the estimated value of tourism.